My 2-year-old daughter has that classic, baby-fine hair of toddlerhood, and for an added challenge, it’s stick-straight with no natural part. Call me selfish, but I’m just not ready to cut bangs into these sweet little hairs just yet. For months, the poor kid looked a little unkept once she’d pull out the headbands we had favored back in the baby days. 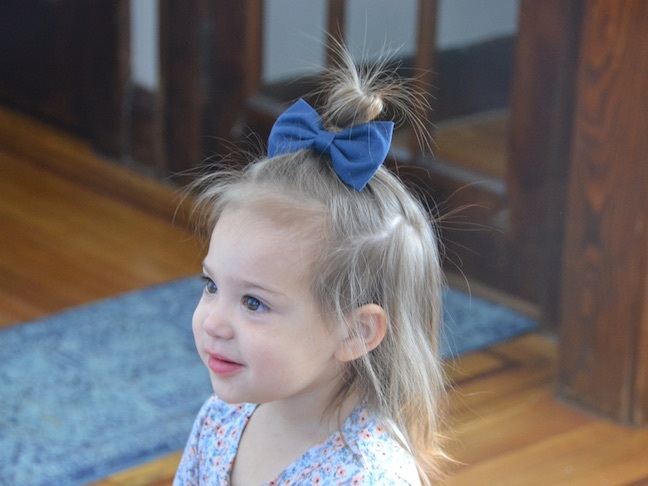 But I took some cues from my own childhood, got creative, and played around with what works for her, to come up with these five quick and easy hairstyles for toddler girls who won’t sit still. 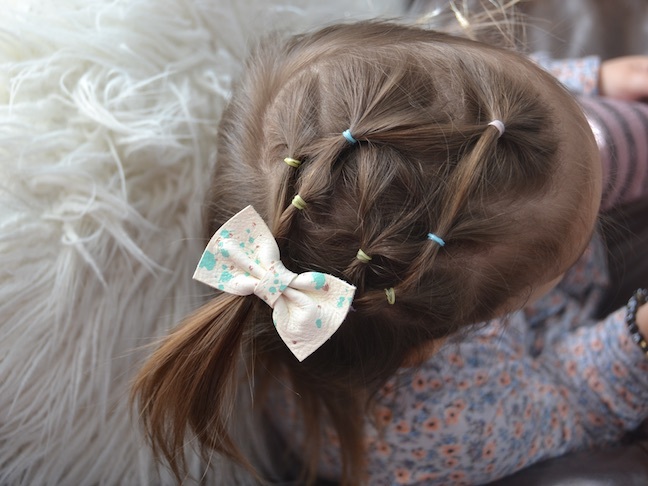 Your dream team for these five quick and easy hairstyles for toddler girls is going to be a big pack of cheap, no-snag baby elastics (I got mine on Amazon for around $10), a bunch of cute hair clips to tuck loose ends into (and create a pretty finishing touch), as well as cartoons and/or lollipops. Am I suggesting you use television and sugar to bribe your child into letting you do her hair? Yes, I am. Because you have a toddler, and I have a toddler, and we all know that getting them to sit still for five minutes is a challenge. Buy organic pops if it makes you feel better. This look is seriously easy and is more fun than the average pony. 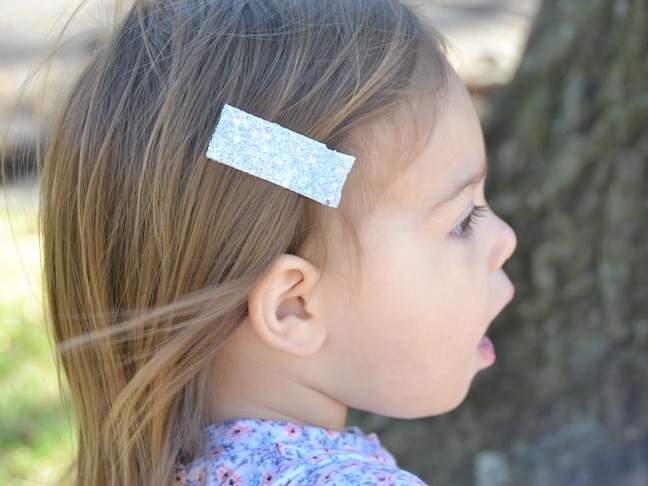 Also, it’s ideal for toddler hair that’s shorter and thinner in some areas, since all of the hair isn’t gathering into the same place, which can lead to fly-aways. 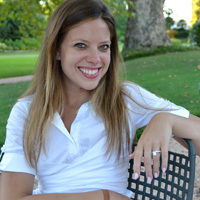 Start at the hairline and pull a wide section back, affixing with an elastic. Split the hair in this pony in half and gather one half with an equal-size section from the side and pull the two together to create a similar pony to the side, securing each with an elastic as you go. I couldn’t wait until my daughter had enough hair for this cute look, and I was delighted to discover it’s a lot easier than it looks. You’ll basically follow the same principals as with the French ponytail, but rather than moving the halved pieces to the side, you’ll be sweeping them underneath the main pony and creating a pouf on top. Create a deep part in the hair and on the side with more volume, make one small ponytail toward the front of the hair and another right behind it. Finger-tease if it doesn’t bother your child. Create a third ponytail in line with the other two, splitting the frontmost pony so that loops around the second and joins the third. 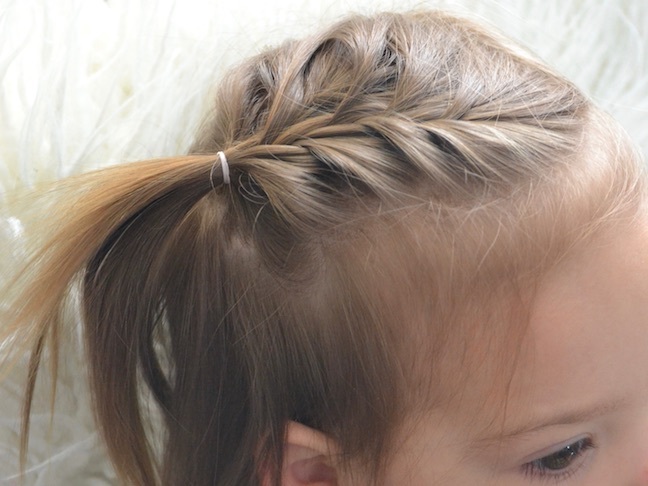 If your tot’s hair falls at least two inches below her ears, you should be able to attempt a mini-French braid on one side, if not both. Since my little girl’s hair is mostly long on the top and in the front, I just sweep the bulkier section to one side and use that. Gather the hair you are using into three small sections. Alternating, cross each section over toward the middle, gathering more hair before you take from one side each time. Repeat until you reach an end where you can secure it with an elastic and it will stay in place. For my daughter, this is typically by the ear or a little below. On longer hair, you can go to the nape of the neck. Remember that unlike when you French braid fuller hair, these sections will be tiny. Don’t grab more than you can pinch between two fingers from any given side at a time; otherwise you’re bound to have pieces fall out from your braid. Secure with an elastic and add a ribbon or clip bow if you’d like. Voila!